An Alabama federal judge currently handling all federal breast implant lawsuits has approved the concept of a master complaint that can be used by plaintiffs' attorneys nationwide, lawyers involved in the case said. 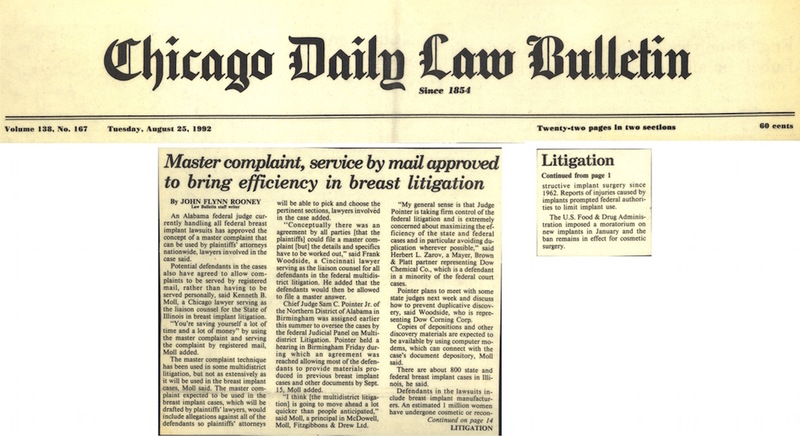 Potential defendants in the cases also have agreed to allow complaints to be served by registered mail, rather than having to be served personally, said Kenneth B. Moll, a Chicago lawyer serving as the liaison counsel for the State of Illinois in breast implant litigation. "You're saving yourself a lot of time and a lot of money" by using the master complaint and serving the complaint by registered mail, Moll added. The master complaint technique has been used in some multidistrict litigation, but not as extensively as it will be used in the breast implant cases, Moll said. The master complaint expected to be used in the breast implant cases, which will be drafted by plaintiff's lawyers, would include allegations against all of the defendants so plaintiffs' attorneys will be able to pick and choose the pertinent sections, lawyers involved in the case added. "Conceptually there was an agreement by all parties [that the plaintiffs] could file a master complaint [but] the details and specifics have to be worked out," said Frank Woodside, a Cincinnati lawyer serving as the liaison counsel for all defendants in the federal multidistrict litigation. He added that the defendants would then be allowed to file a master answer. Chief Judge Sam C. Pointer Jr. of the Northern District of Alabama in Birmingham was assigned earlier this summer to oversee the cases by the federal Judicial Panel on Multidistrict Litigation. Pointer held a hearing in Birmingham Friday during which an agreement was reached allowing most of the defendants to provide materials produced in previous breast implant cases and other documents by Sept. 15, Moll added. "I think [the multidistrict litigation] is going to move ahead a lot quicker than people anticipated," said Moll, a principal in McDowell, Moll, Fitzgibbons & Drew Ltd.
"My general sense is that Judge Pointer is taking firm control of the federal litigation and is extremely concerned about maximizing the efficiency of the state and federal cases and in particular avoiding duplication wherever possible," said Herbert L. Zarov, a Mayer, Brown & Platt partner representing Dow Chemical Co., which is a defendant in a minority of the federal court cases. Pointer plans to meet with some state judges next week and discuss how to prevent duplicative discovery, said Woodside, who is representing Dow Corning Corp. Copies of depositions and other discovery materials are expected to be available by using computer modems, which can connect with the case's document depository, Moll said. There are about 800 state and federal breast implant cases in Illinois, he said. Defendants in the lawsuits include breast implant manufacturers. An estimated 1 million women have undergone cosmetic or reconstructive implant surgery since 1962. Reports of injuries caused by implants prompted federal authorities to limit implant use. The U.S. Food & Drug Administration imposed a moratorium on new implants in January and the ban remains in effect for cosmetic surgery.